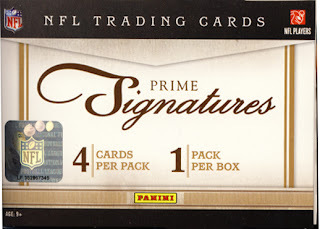 2011 Panini Prime Signatures Football is a product that has its advantages and disadvantages. 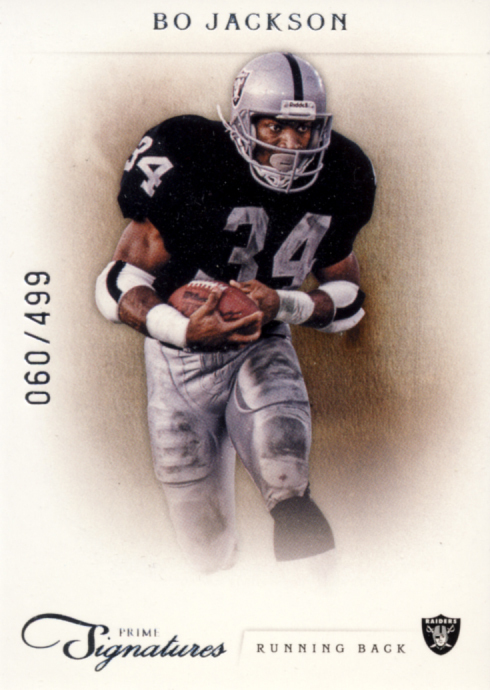 On the plus side you have a product that could yield a big hit at a modest price point which allows a broader range of collectors purchase it and walk away with an amazing card. On the negative side, if you don’t hit big, the box can be a total bust. Normally this is the understood scenario for this type of product, which is perfectly acceptable. But here, with a quick look at the checklist of hits, it appears the likelihood of pulling a big hit is lower than usual which is amplified because there is only one hit per box and not enough additional cards to provide value as a backup. In addition, with only one hit per the box, there is no opportunity to spread the risk. Prime Signatures Football falls into our premium cards category. Each box contains 4 cards with 1 Autograph card per box. No complaints here about the look of these cards. They are nicely done with good blending of the player image into the white background. Nice foil accents. Numbering on the front of the card works well. There is a descent amount of information on the backs of the cards. Here is where the product falls short. It is not the lack of highly desirable players autographs. 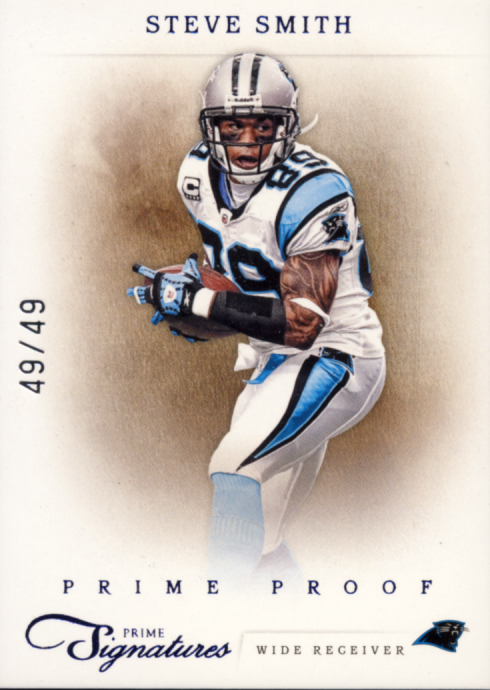 They are all here, the rookie heroes of 2011 like Cam Newton and A.J. Green along with current established stars like Aaron Rodgers and Tom Brady, and also retired Hall of Famers like Joe Namath and Bart Starr. It is the ratio that they appear that is the problem. 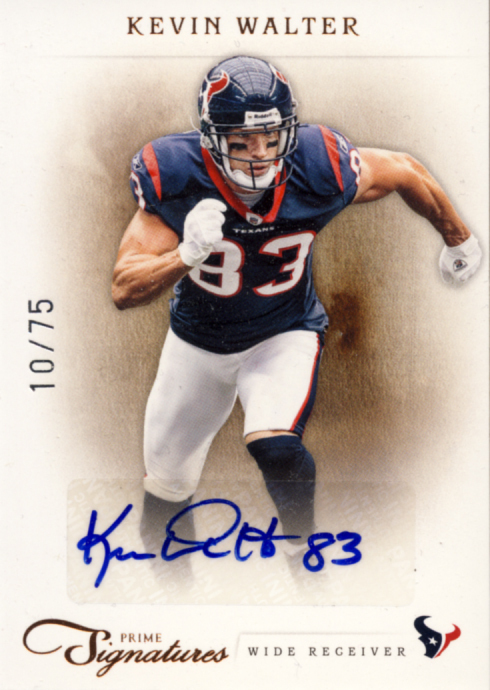 With the inclusion of large quantities of close to 90 rookies that had modest first seasons at best and just under 60 mid-level veteran players making up the bulk of the hits in this product, the deck seems stacked greatly in favor of the house. If you pull the one of the big hits, most definitely. But pull someone like Nathan Enderle, as your only hit, definitely not. Unfortunately I think this is a product that you might stop at one purchase. If you hit big on your first try, I’m not so sure you will be willing to roll the dice again. You could say that buying by the case here would spread some of the risk but then you lose the one advantage built into this product, its modest price point.